Adventure golf is competitive fun that offers plenty of thrills and laughs to just about anyone and everyone. Armed with nothing more than a ball and putter, the aim of the game is to get around the course in as few attempts as possible - and to work your way through the various pirate challenges that you will encounter on your way. This is a great day out for the whole family or a group friends looking for a social way to spend an afternoon. Schools and youth groups are welcome and the course is both fun and educational. Corporate groups can kick back and enjoy a lively, competitive game. What better way to escape the office, why not combine a wine experience with your game and make it a full day's experience at Benguela Cove. 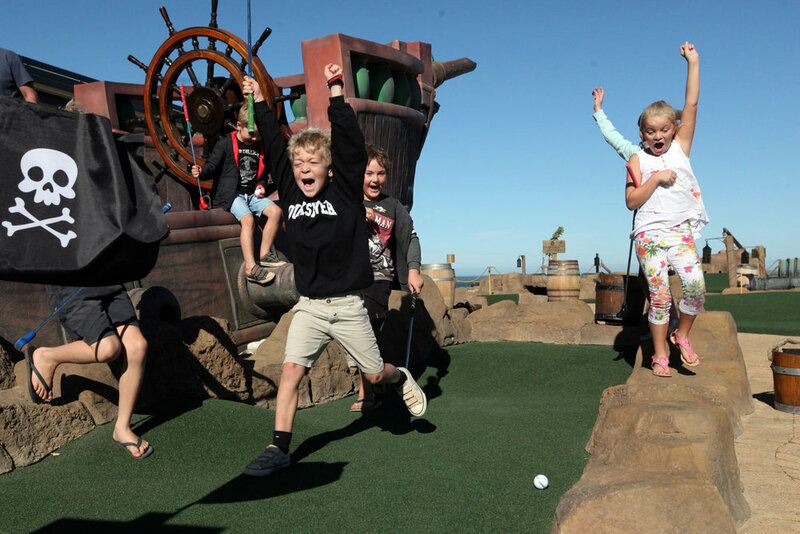 Benguela Cove Pirate Adventure Golf course, is made up of 18 holes of fun and thrilling adventures suitable for all ages. The course is an adventure in itself, navigate your way through the 18 holes and attempt to get to the end in as few attempts as possible. On the way you will encounter pirates and plenty of skullduggery. Spectacularly themed and festooned with obstacles including a huge pirate ship, streams, rafts, pirates and a giant skull. Pirate golf is swashbuckling fun for everyone. Benguela Splash, the New Coolest Splash Pad for Kids! 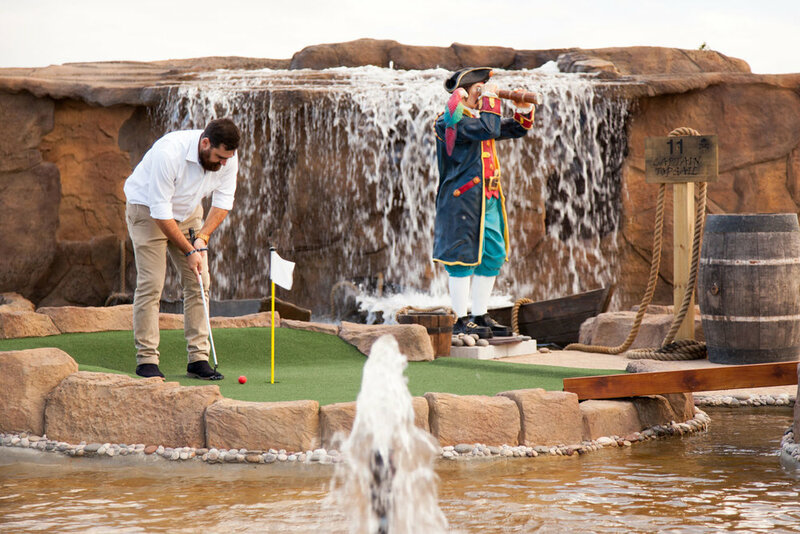 Spoil the family with a round of Pirate Golf and gain 1 hour free entry to Benguela Splash ! The new splash pad with a variety of fun water spraying, squirting and dumping amusements, so get the family ready for an unforgettable wet, wild and fun experience. Fully licensed for wines | Regrettably no corkage allowed. Pirate Adventure Golf is played with a ball and a putter. The aim of the game is to get the ball from the teeing-off area into the hole in as few strokes as possible. The holes must be played in sequential order. Hole jumping is not permitted. If 6 strokes are made and the ball hasn't been holed an additional 7 points should be added for each additional stroke. Pirate golf has taken over the wine region of the Overberg. Spend the day with the pirates at our adventure golf which offers thrills for parties of adults. We are able to offer adult groups a fantastic experience for larger groups, the perfect way to team build and get away from your desk. Get in touch with us and we will help plan your day out. Offering plenty of pirate encounters. Benguela Cove’s Pirate Adventure Golf is the ideal place to host a thrilling children’s party out. Whether it's a birthday party or another occasion, book your party with us from only R220 per child.